Car rides have not been positive experiences for Brontë. While many parents take their howling infants on impromptu car rides to calm them down, our daughter tends to shriek at the top of her lungs whenever she is in a car. Since she can keep it up for well over an hour, car rides with Brontë have so far not been very positive experiences for her parents either. Often, me threading my arm into the back seat to hold her hand is the only thing that calms her, but even this offers no comfort in a car wash. Brontë is absolutely terrified of car washes. The same child who has been bolting toward the highest slide on the playground and throwing herself down it head first, ever since she could walk, will erupt in a howling fit of terror the moment water starts misting the car. Am I completely dating myself here? 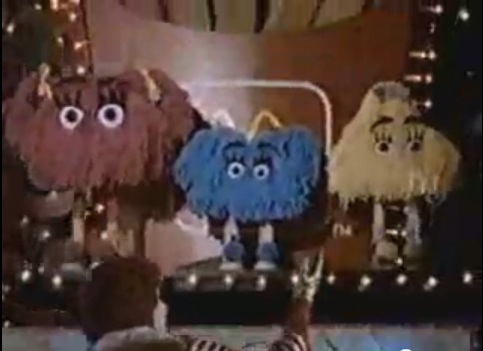 Anyone else remember the Fry Kids, those multicolored mops with google-y eyes that McDonald’s used to shill its French fries from 1979 to 1996? While we are on the subject of the McDonald’s cast, I’d like to share a little theory of mine. Remember Grimace, that big purple guy that ran around McDonald Land, drinking shakes all the time? He was a big celebrity for a while, then all of a sudden drops off the face of the Earth. I think alcoholism did him in. The pressures of show business, having to constantly smile around all those hungry kids… he starts Irishing up those shakes at some point, just to take the edge off, which eventually leads to a serious problem. Hey, it was in his genes… his lesser-known uncle was Uncle O’Grimacey, who visited around St. Patrick’s Day every year to hawk his Shamrock Shakes. Well, I bet Uncle O’Grimacey was visiting one time when he noticed how stressed out his nephew was, so he whips up some “Shamrock” shakes and before you know it, they are hashing out ancient family dramas and singing songs from the old country together. 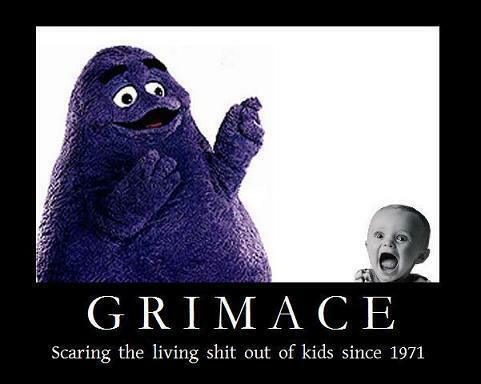 Grimace was able to keep his work and private life separate at first, but his behavior became increasingly unpredictable, and before anyone realized what was happening, he was sitting kids down so he could “tell them what their problem is,” and you just can’t have fantasy characters acting out like that around kids. McDonald’s quietly phased him out and that was the end of his career. But at some point before he was run out of town, Grimace had a brief fling with some unknown coworker that led to an illegitimate child. 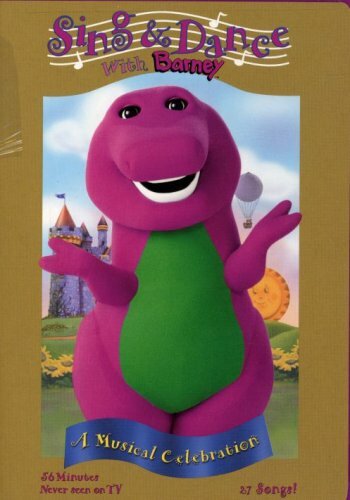 That child grew up to become Barney, the children’s pop superstar. Think about it. He’s big and purple, like his dad, and sings with the preternatural cheerfulness that only someone who has been through a lot of group therapy will. All this “I love you and you love me” business sounds a lot like someone who has worked at hashing out their self-esteem issues and can’t handle any more chaos. It smack of overcompensation. So anyway, back to my car story. Brontë chews her fingers in abject terror whenever the Fry Kids assault our car during a hurricane, which seems reasonable enough when seen in that perspective, and won’t calm down despite ample reassurance. It’s part of her generalized car anxiety. One day, Brontë and I were sitting in the car together after her dad ran into the store for something quick. I figured I could unlock her carseat to let her stretch out her limbs before her dad returned, maybe it would feel good to move around while we are parked. 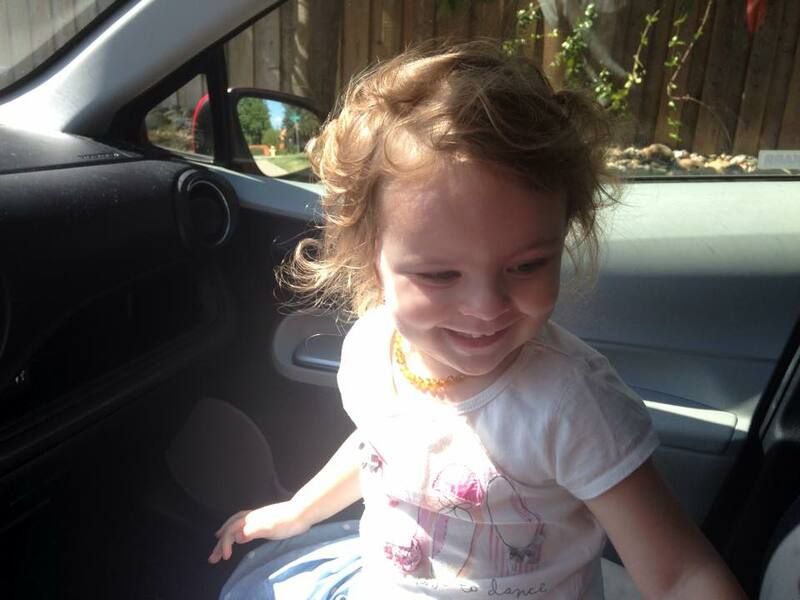 As soon as I let her loose, she scrambles into the front seat, giggling. 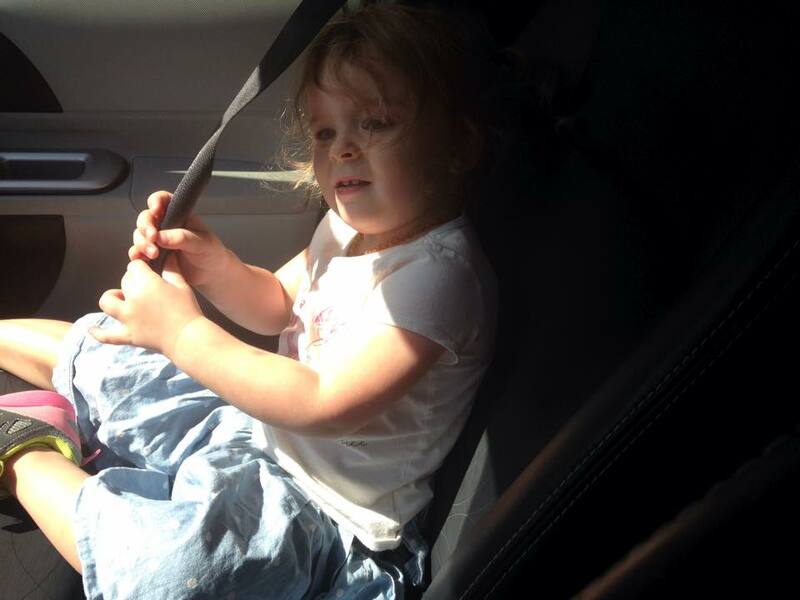 She reaches over to the seat belt, pulls it across her body, and tries to snap it closed. She digs into the glove compartment and starts flipping through the car manual. 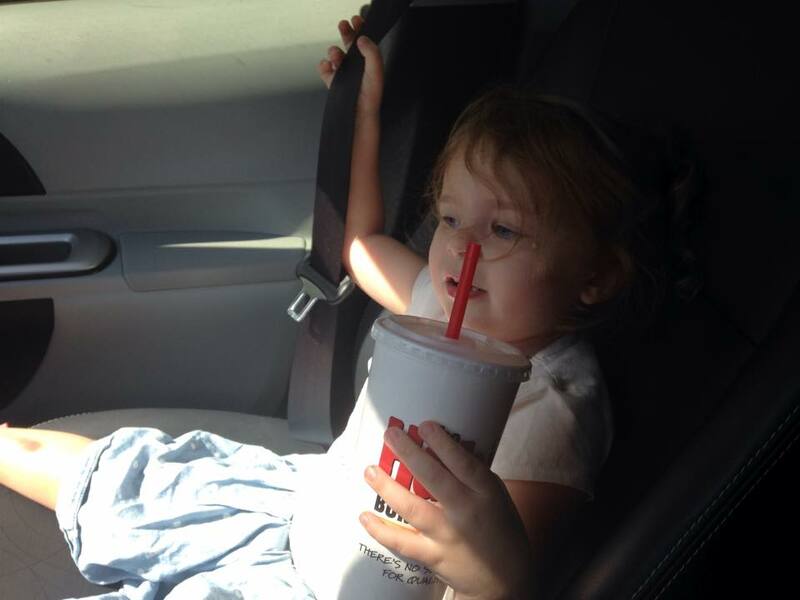 She reaches into the drink holder and holds a cup of iced tea like a grownup, sipping out o f the straw while trying to turn the radio on. She’s having a blast. Since she has spent most of her waking car hours in the back seat in a straightjacket (or “car seat,”) I didn’t think my 2-year-old daughter knew what was going on in the front. Obviously, I was wrong. 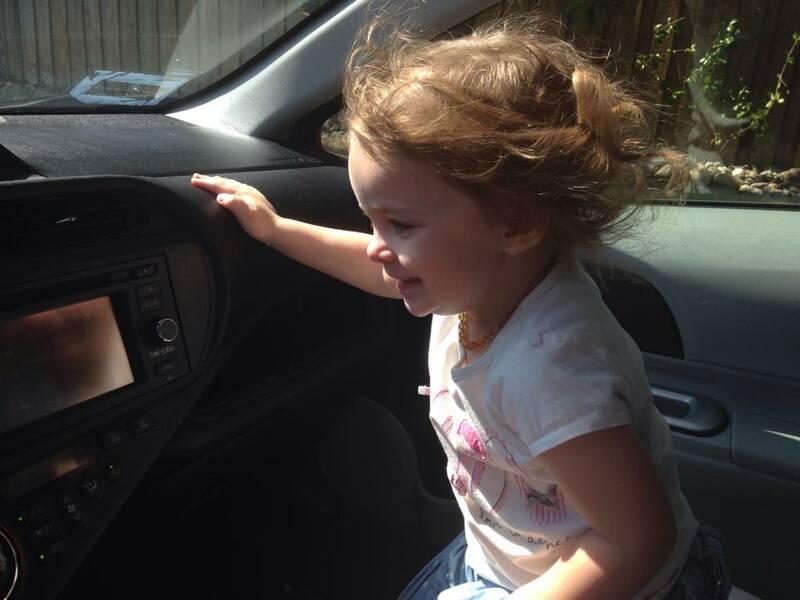 She has watched her parents intently, seeing how they play with the radio, put seat belts on, fumble in the glove compartment… she just wanted to be part of the action all along. The takeaway? Your kids study your behavior and copy it, even if you don’t realize it. That’s why “do as I say, not as I do” isn’t very convincing. Also, don’t Irish up your beverages at work.